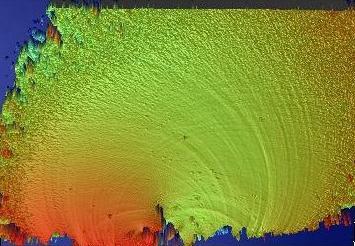 Optical profilometer image of the broken surface of a glass rod shows height of peaks (yellows and reds) and valleys (blues and purples) of the fracture surface in millionths of a meter. Curved ribs reveal the path of the stress waves through the glass. Image shows an area 1 x 1.3 millimeters. See also www.nist.gov/public affairs/techbeat/tb2007 0913.htm#fractography. Credit: R. Gates/NIST Disclaimer: Any mention of commercial products within NIST web pages is for information only; it does not imply recommendation or endorsement by NIST. Use of NIST Information: These World Wide Web pages are provided as a public service by the National Institute of Standards and Technology (NIST). With the exception of material marked as copyrighted, information presented on these pages is considered public information and may be distributed or copied. Use of appropriate byline/photo/image credits is requested.